Home » Awesome » Favorites » Video » Video Games » A Brand New Easter Egg Found in Mike Tyson's Punch-Out!! A Brand New Easter Egg Found in Mike Tyson's Punch-Out!! 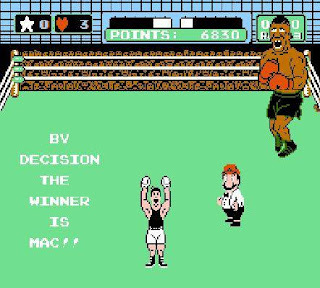 Unless you had a deprived childhood, you've probably heard of the Nintendo game "Mike Tyson's Punch-Out!!" There's also the possibility that you simply know it as "Punch-Out!!" for various reasons that I won't get into here. Secrets have been leaked about the game over the years, but Reddit user midwesternhousewives discovered a brand new easter egg in the game that tells you exactly when you need to punch to knock out your opponents with one hit. If you are a fan of the game, like I was, this will have you feeling very mixed emotions... How did I not see this before? Why did none of my friends know about this? How can I go back in time and let my 10 year old self know? Does my life have meaning anymore?